BUT then, I snap myself back into reality, and realize, IF you don’t know, YOU don’t know! It is OK, because we are ALL different and we MUST, somehow, learn to all live together! 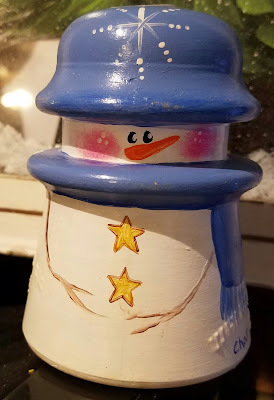 Now, with that being said, I am NOT going to snap myself back into reality for having mean thoughts for those people who paint, who ASK if a painted tea kettle or tea pot or knife, or serving spoon can be used after it has been painted…NOT going to happen…I cannot make myself understand THAT thinking! 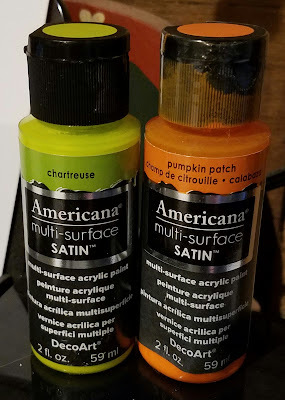 So, I want to share just a bit about painting a SLICK surface. Surfaces are basically divided into SLICK surfaces and Wooden Surfaces. Slick covers an object that paint will easily slide off if it is not properly prepared. Some slick surfaces are~~glass, plastic, and metal. When you have a SLICK surface, you must prepare it in some way to give the paint “tooth” to allow it to stick to the surface. Now, this is where I have problems with painters. IF you have a GLASS surface, it is a glass surface. All glass surfaces must have a TOOTH to help the paint stick or it MUST be painted with a paint that is designed specifically for glass. It doesn’t matter if it is a small glass candle holder or a large window…glass is glass! There are so many different ways to achieve this “tooth” and anyone who paints for any length of time on different surfaces, develops their favorite method, so I think this is where the confusion starts for painters…they want to KNOW what someone else does. We are often looking for an easy way to do things, and there is nothing wrong with that. I want to share just a few options to HELP you become confident in your knowledge. 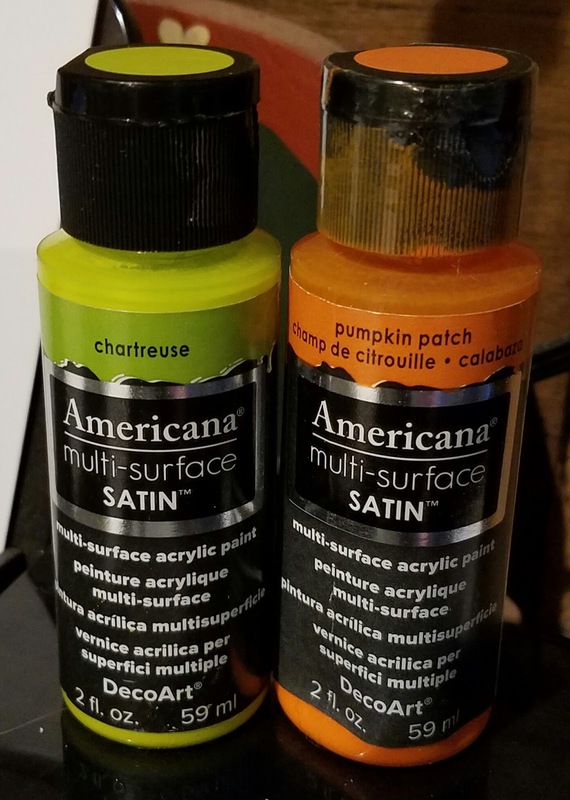 One of my most FAVORITE products to use is DecoArt Paint Adhesion Medium. You mix the product in a 50:50 ratio with the paint. This bottle was painted using this product. It took several coats to get a good coverage, but it did and the paint sticks! I applied two coats with the mix, and then added coats of straight paint until it was covered like I wanted. This pattern was in www.paintingezine.com last year, if you are interested! 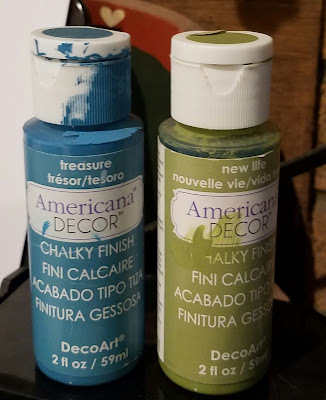 DecoArt Chalky Finish Paint is absolutely one of my most favorite paints to use as a background on ANY surface, especially if you want the piece to have a cottage chic or primitive feel to the piece. Again, it will take several coats, but it leaves a smooth surface. 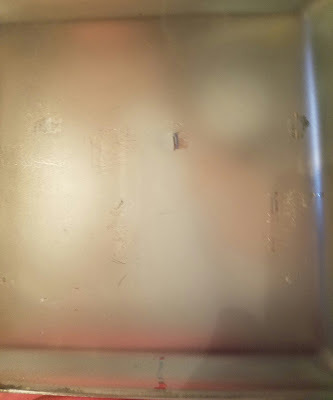 You must be careful when using ANY paint when painting on glass, because it will easily scrap off, until it has properly cured or been properly sealed. 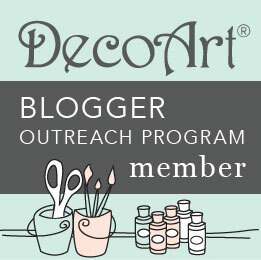 DecoArt also makes Chalky Finish for Glass that must be baked in the oven. 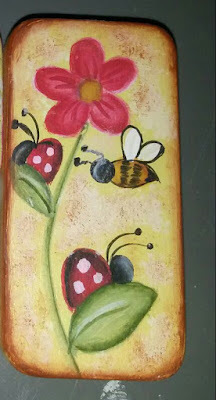 I painted this vase that was saved from my Daddy’s funeral. 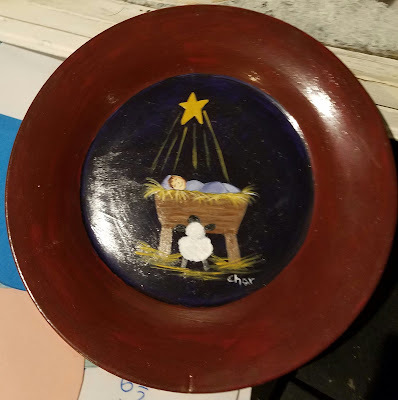 Yes, I intended to remove some of the paint to give it an old, time-worn look. This was so simple. The hard part was waiting the four days to cure before I baked it! 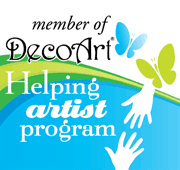 DecoArt Multi Surface Satins are another option for painting on glass. 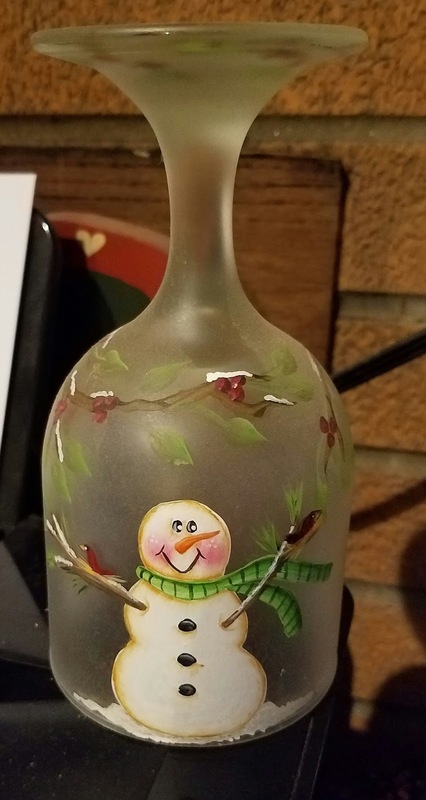 These glasses were painted with the product. 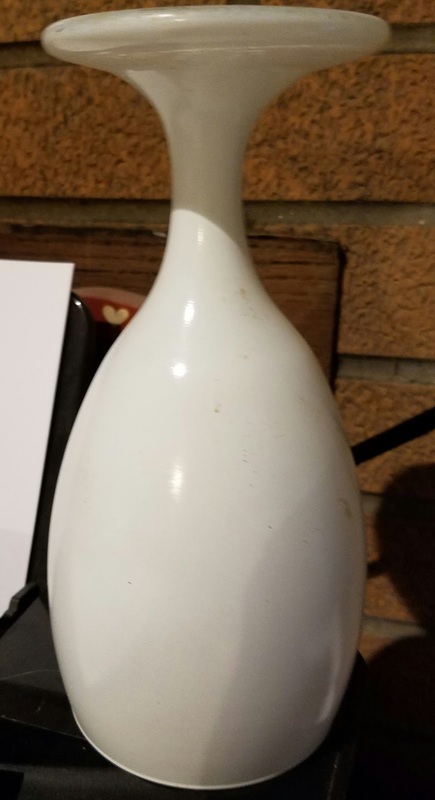 Be sure to follow the directions on the bottle for applying AND for cleaning the items. Another method is to spray paint your surface with either an Auto Primer or with a FLAT spray paint. I have used this on dozens of items. This is a great way to prepare your dominoes~~you can spray a dozen at a time!! 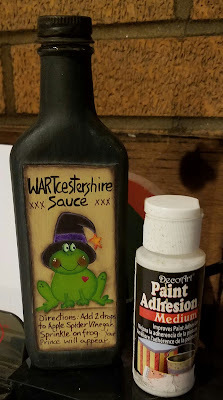 I have used this method for painting glasses and tea pots. 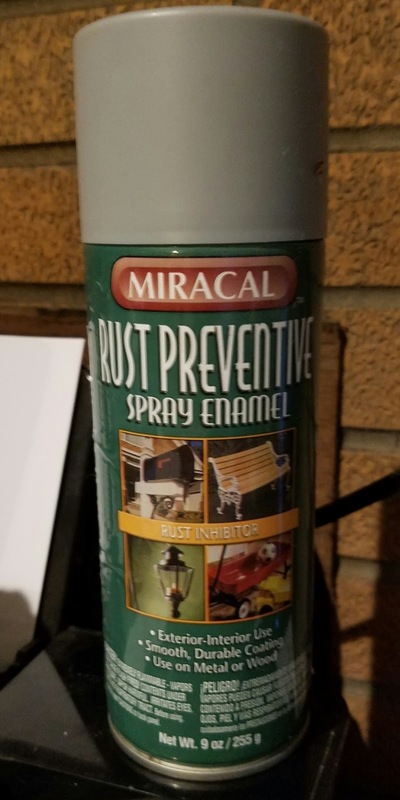 This Rust Preventive Spray Enamel from the Dollar General Store is one of my favorites! Lots of people use Frosting Spray, especially those who paint lots of the glass blocks. It worked fine, but PERSONALLY, I got a weird feeling of insecurity when the spray came off as I was painting it. 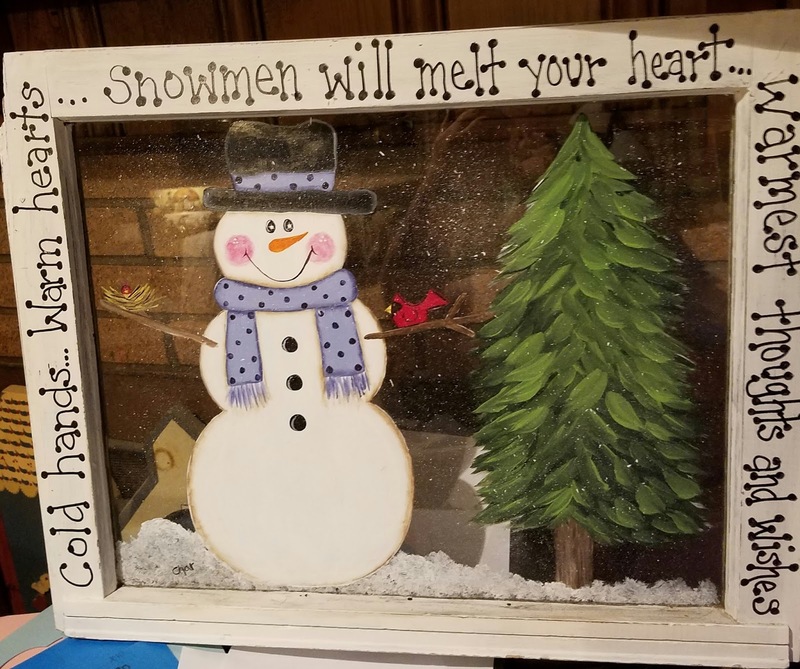 I have a FB friend who paints hundreds of blocks this way and has had no problem…I am certain that our humidity in Middle Tennessee might have had something to do with it coming off as I painted…so, I trust Lori! 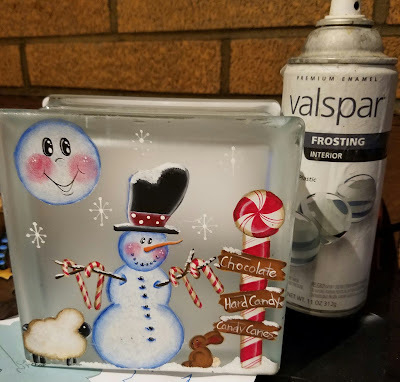 this was the back of the glass..
My favorite product to use to paint backgrounds on glass blocks is DecoArt Frosted Gloss Enamels…you can’t beat it! It can be painted on with a brush or pounced on with a sponge. To save, simply click on the picture of the line drawing, right click and choose SAVE TO COMPUTER…I have no clue what size it will print, but just resize it as you wish…It would make a really cute sign, too! 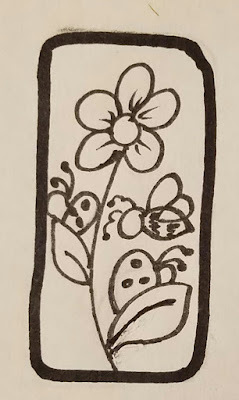 Add a background, another flower or two, another bee and ladybug…You are more than welcome to paint it as you wish, please just don’t claim it as your own, because, well, that “ain’t nice” and we sure do want to play nice! Great suggestions!!! I'm with you on Google. One team that i'm on, will say to me things like - "I knew you'd find the answer." I just reply, "If all else fails, Goggle it!" lol. Love love all your tips. Thank you! 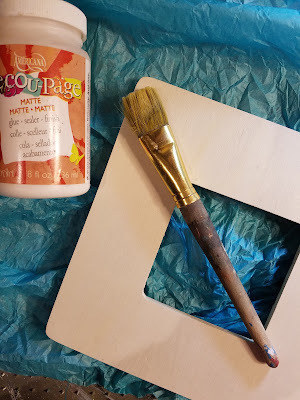 I love to use spary primer on my glass jars. Its easier for me and i am with you on Google! I Google everything.